A winner will be chosen randomly using a computer generated thingummybob. Melody Rose ceramics - vintage chinaware upcycled with transfers. More tea vicar? Melody Rose has also just launched some new tea cups and saucers, echoing vintage style shapes - handmade in Stoke on Trent and finished at the Melody Rose studios. I lingered for far too long at Barbara Wiggins' stand at the Handmade in Britain show at Chelsea Town Hall earlier this month (last blogged about here)- her leatherbound notebooks, address books and diaries glinting at me, tempting me to buy not one but several. She had also brought her satchels, purses and make-up bags in a rainbow of colours which were very popular with the swarm of customers around her stand. I nearly bought the neon pink satchel (see pic below). One of the reasons I couldn't tear myself away from Barbara Wiggins stand was Barbara herself - we did have a good old chat. One of the best things about writing this blog has been meeting the designer-makers, finding out about their inspirations, design processes and techniques. Barbara has a training in fine art, and comes from a family with artistic and creative skills, which has influenced her designs. Caroline Groves makes bespoke shoes - it was love at first sight when I saw these vintage styles. Shoes made to fit my awkward high instep, out of beautiful leather, in an elegant style that would make my feet look dainty: my idea of heaven. The commissioning process takes several weeks. Caroline makes a bespoke wooden last for your foot on which your shoe is crafted, from leathers which you choose: anything from simple calf leather to exotic crocodile. As you would expect for a work of art, these shoes cost ££££. The Selvedge Winter Fair, held in Chelsea Town Hall earlier this month, had some fantastic designer-makers - pics coming up in the next posts. But first of all feast your eyes on the hall itself. It was great to finally meet Damson & Slate at the Best of Britannia event in the Farmiloe Building, Clerkenwell (Damson & Slate last blogged about here - they sell a lovely slate soap dish which I still have my eye on). 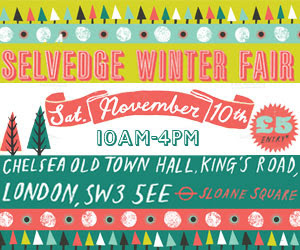 They were also at Selvedge Winter Fair a couple of weeks ago, more posts coming up soon about this event. Damson & Slate sell beautiful Welsh-made products - their website says: 'we are actively supporting and encouraging a new generation of craftspeople who are using traditional skills in a fresh way to make truly beautiful gifts and interior accessories.' Which, of course, is what I love about them. They brought with them to the Fairs a fine selection of their textiles. The 'Amroth' throw in the pic below caught my eye - it's a herringbone pattern woven in traditional looms and based on a vintage herringbone pattern, available in Indian Red, Barley Brown, Slate Grey, Oak Green and Damson. Size 150 x 200 cm. Maiko Dawson, who I saw at MADE London in October (where I met Holly Berry, Sarah Elwick and Catriona Faulkner) and Handmade in Britain last week makes shoes, bags and purses in a rainbow of colours that look as tasty as macarons. Her website shows her full range of products, and you can contact her directly to buy them. Rachel Orme, Anna P and Selina Cheong design and make some of the very prettiest handbags and purses that I have found on my travels. High quality leathers and fabrics, and attention to detail are their trademarks. Many of their pieces are one-off from specially sourced leather. Here are some of their newest pieces that were on show at the Spirit of Christmas show earlier this month. Some of my favourites from the Country Living Fair - last day today, finishes at 3pm, so get yourself along to the Islington Business Design Centre. Having admired Holly Berry's blankets at The Shop Floor Project (blogged about here) on many visits I was really pleased to meet the girl herself, and her blankets, at MADE London in October. Holly designs super gorgeous soft cashmere and merino wraps and blankets decorated with morse code which spells out LOVE, and new for this season HOLD ME. These are pieces to treasure, something for your hope chest (they would make excellent wedding presents - but I'm not suggesting you need to be entangled in the institution of matrimony to have one of these blankets in your life). Sarah Elwick was at MADE London in October (last blogged about here). She designs knitwear made from merino and Scottish lambswool, and works with a small sustainable knitwear producer from the Shetlands to make her colourful blankets, scarves and cushions. This season she's used fluro pink which I particularly like...below are some blankets (pram / cot sized). Have a look at Sarah's website for her other products: she also makes tubescarves in stripes and herringbone. I met Catriona Faulkner at MADE London which was held at the end of October in a church at No1 Marylebone. She makes some of the most unique and interesting pieces that I have seen lately. Using tiny beads, sequins, buttons and bits and pieces that Catriona spies with her magpie eyes, each pieces is handsewn to create a treasure to wear or frame. These are going on my Christmas list.